Intel kickstarted the popularity of small-form-factor computing when it released the first Next Unit of Computing (NUC) device in early 2013. Since that release the number of NUC-style mini PCs has increased exponentially and successive new CPU iterations from Intel have helped to present desktop-class performance into a compact package. Now Intel is trying it all again but this time with an even smaller package - enter the Intel Compute Stick. Arriving in a form-factor that isn't much larger than a high-performance USB WiFi adapter the Intel Compute Stick packs the hardware of a Bay Trail Windows tablet into a tiny space. Powering the Compute Stick is the company's quad-core Bay Trail Atom Z3735F processor with a 1.33GHz to 1.88GHz frequency range and 2GB of DDR3 RAM. Storage is covered by 32GB of eMMC which houses a 32-bit version of Windows 8.1, though additional storage is available through a microSD card slot. 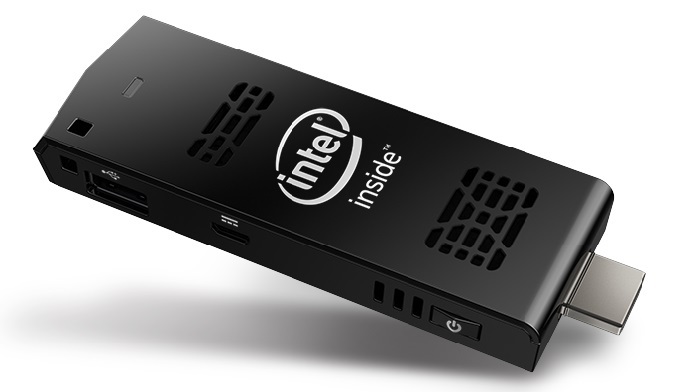 Since the Intel Compute Stick is a fully-functional Windows 8.1 device in a highly compact form-factor the possibly uses for it are extensive. Intel touts a number of these in its product pitch including using the device to stream media content or games as well as accessing desktop-class internet browsing, cloud content and productivity applications, all through your TV or any other HDMI-connected display. The Intel Compute Stick arrives in two flavours, the aforementioned device which is the subject of today's review is the STCK1A32WFC. Another model, the STCK1A8LFC, sporting 1GB of RAM, 8GB of eMMC storage and the Ubuntu 14.04 OS, will later on this year. The Windows 8.1 Compute Stick has a target retail price of $150 while the Ubuntu Compute Stick should cost around $110. These prices, according to Intel, will fluctuate according to demand. The Intel Compute Stick comes housed in a chassis measuring in at 103mm by 37mm by 12mm. Despite the low-power internals with a sub-10 watt TDP the Compute Stick requires active cooling from a miniscule 20mm fan to keep thermals under control. The use of an active cooling source is part of what allows Intel to keep the small-form-factor viable, because a passive solution would add considerably more weight and size to the device. Wired connectivity is fairly basic with a micro-USB power input, a USB 2.0 port, microSD card slot supporting up to 128GB of capacity and HDMI output capable of a maximum resolution of 1,920x1,080. Users with multiple USB devices can attach a USB hub to the single port to expand USB options and, depending on how power-hungry those USB devices are, external power could be required. Wireless connectivity assumes the form of Bluetooth and 802.11n WiFi for connecting wireless peripherals and acquiring internet connectivity.